111: I had to improvise. I feel that Rei is the only one who won’t like the food he made. I had a few people say that they would be willing to donate for extra pages so I’m taking tips again. There’s a new blog post with a new donation bar here. God, I thought he was eating green condoms too! Ooh, Nai’ka food, I’ve been looking forward to this! Out of curiosity, are the ngofu some sort of edible parcel filled with meat/vegetables or some such thing, like ravioli? Yeah they\’re sort of like ravioli. They can be stuffed with all different things. 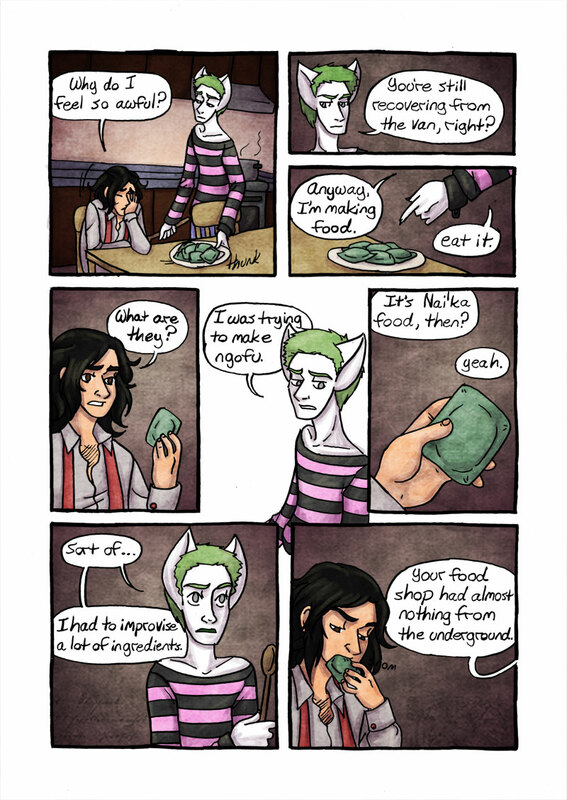 That kind of looks like the green soap bars I always end up getting… It doesn’t help that they actually smell edible.